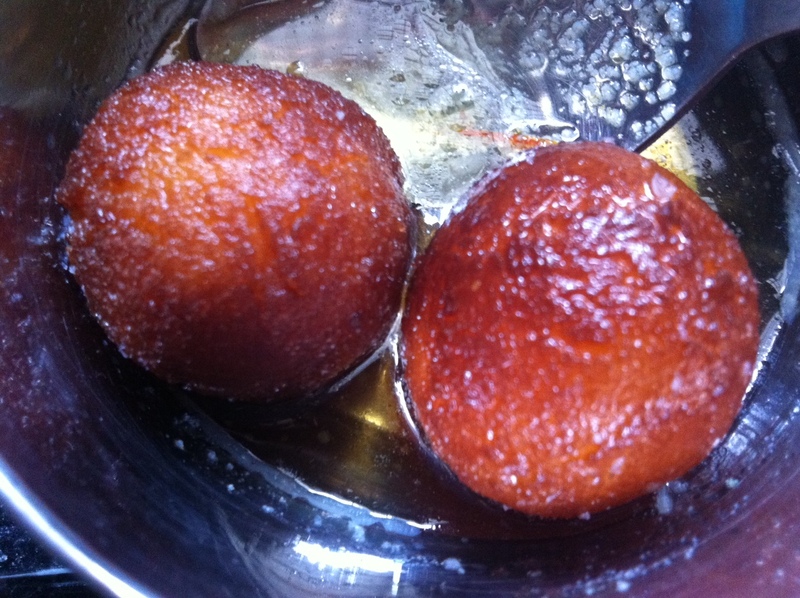 Gulab Jamun is the quintessential Indian sweet that compliments all festivals and all occasions. It is available year round and I have not met a single person till date who will say no to a gulab jamun. Surprisingly, it is really simple to make at home and takes an amazingly small amount of time too. Sieve milk powder and maida to remove any lumps. Mix baking soda. Add the melted butter and mix to get a crumbly mixture. Slowly add milk, a tablespoon at a time, to get a really sticky dough. Cover and let the dough rest for 10-15 mins. Once the dough is rested, it won’t be sticky. Make 20 balls and insert a raisin/misri/anardana in the middle. This will ensure the centre is not hard and will also present a wonderful surprise. You can also make a small thumbprint with haldi(turmeric powder) to get a yellow centre. Once the balls are made, heat the sugar with cardamom and water to boiling. Let simmer for 5 mins till sugar is completely dissolved to get sugar syrup. Take it off the heat. Heat the oil/ghee. It should be 1 inch in depth in the kadhai or frying pan. Gently fry the balls at a very low heat to get a lovely golden colour. Let the balls rest for a couple of mins and then soak them in the sugar syrup for atleast 20 mins. The balls will actually double in size at this stage. Sprinkle with chopped nuts before serving.